I love Feliks and his world records for obvious reasons. One, they’re world records! Another reason is because He makes his solves look so easy and he uses many of the techniques I use, and it amazes me that the techniques that I use can achieve world records. Even though I’m practically on his tail. When I saw his 3.52 solve on Youtube, it made kind of mad that solves that aren’t at competitions can’t be world records. But still! So you know how I said that I said that I really want to be like Feliks? I said that for two reasons. One is because of his world records. Records aren’t the only thing that matter to me though! It also matters to me that we are very similar in the way we cube. We both believe that F2L is very important, and we both know a fair amount of algorithms, though he knows more. We are also similar in the fact that we are both sub 10. I don’t have the experience to get much faster, but we have a very similar time range. 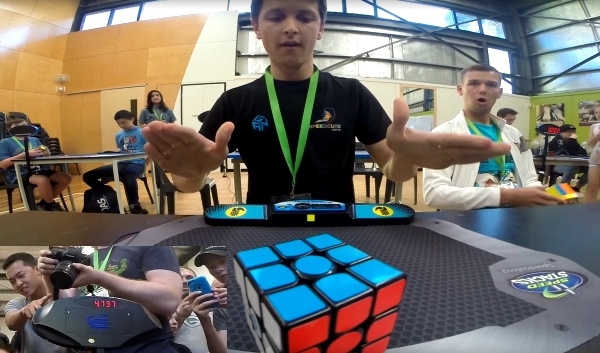 These are the reasons that my favourite cuber is Feliks Zemdegs. Again, he holds nine world records! I know it was very close to Mats Valk’s record, but a record is a record! Again, I also think to myself that one day, I might be able to hold a world record, and maybe break one of his.